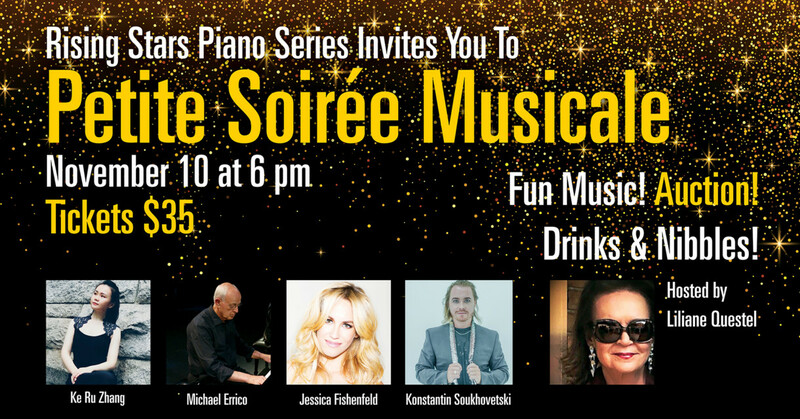 It’s with great enthusiasm that we are announcing Rising Stars’ Petite Soirée Musicale on Saturday November 10 at 6 PM. We have been working on a program which should be a joy to listen to by all. Short works by four special performers. Keru Zhang, known by many Pianofest followers as well as Rising Stars’ audience will impress us with a formidable Hungarian Rhapsody by Liszt, Jessica Fishenfeld, an opera singer and actor from NYC will delight us with “ Summertime", "O Mio Babbino Caro", and "I Could've Danced All Night”, Dr. Mike Errico will charm us with his own excerpts of West Side Story and our dear Konstantin Soukhovetski will end the program with two of his fabulous cabaret transcriptions of Broadway songs from his performances at the Southampton Inn's Claude’s critically acclaimed residency this past summer. We are lucky to have such a diverse musical line-up to compliment wine, bubbles, nibbles and a small auction. I promise you an evening to remember! At only $35 per person - this is the best Gala deal in all of New York! Call in your reservation now and tell all your friends to come and join our party!